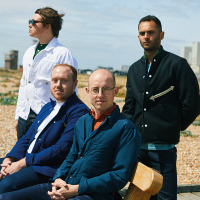 Obviously on a run with knocking out decent albums, Bombay Bicycle Club have announced another one (their third) for later in the autumn. Set to be released just 15 months after the Top 10 set, "Flaws" (nominated for an Ivor Novello award), "A Different Kind of Fix" should appear at the end of August and preceded by a single entitled "Shuffle", due out next week. These are bigger times than their struggles with inaugural gigs in the middle of the last decade, although times changed dramatically in 2006 when they were announced as one of the winning bands at the V Festival's "Road To V" competition. They appeared on the Channel 4 stage soon after, opening the weekend's entertainment in Chelmsford. Numerous festivals later, plus a string of minor singles, their fortunes improved further with a deal with Island Records - and a hit album. With "....Fix", they might just do it all again. Their extensive UK tour begins in Brighton on 30th September, followed by Newcastle on 1st October, Leeds on the 3rd etc until they return to home-territory on the 19th at the Brixton Academy. Tickets will go on sale this Thursday at 9am and should sell very well.